Historically, Valuable Library Books Were Protected With? Before the advent of modern commercial printing processes, the production of books was a laborious and costly one. 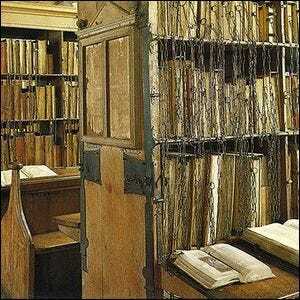 So costly, in fact, that early libraries went to great measures to ensure that their books were safe and sound. The most common protective measure was simply chaining the book to the shelf upon which it rested, ensuring it could wander no further from its home than the length of the chain. The photo here is of the library stacks at Hereford Cathedral in Herefordshire, England. The library is over 900 years old and recently enjoyed extensive restoration to preserve the shelving, books, and chain system—it’s the largest surviving chained book library in the world. The Hereford collection is open to the public and serves as a museum so, should you find yourself in the area, you could pop in to see the books and shelving arrangements in person. Speaking of such, you may note from the photo that the books are shelved in reverse with the spines facing inwards. This was a common practice that, although it may have made identifying individual books a bit more difficult, made removing them from the shelf and reading them without tangling the chains up significantly easier. While some libraries had lengthy chains attached to the books, the typical arrangement was to pair each shelf with a small reading desk so that the book could be examined right at the shelf upon which it was stored. A much more rare arrangement to the chained book system was a book cage wherein the librarian would lock the reader in a cage or caged room with the valuable book they wished to study (Marsh’s Library in Dublin is a notable library that employed a book cage). Image courtesy of Hereford Cathedral.